Conference Immunotherapy Radiotherapy Combinations, NYC · 2017, Paris S. et al. 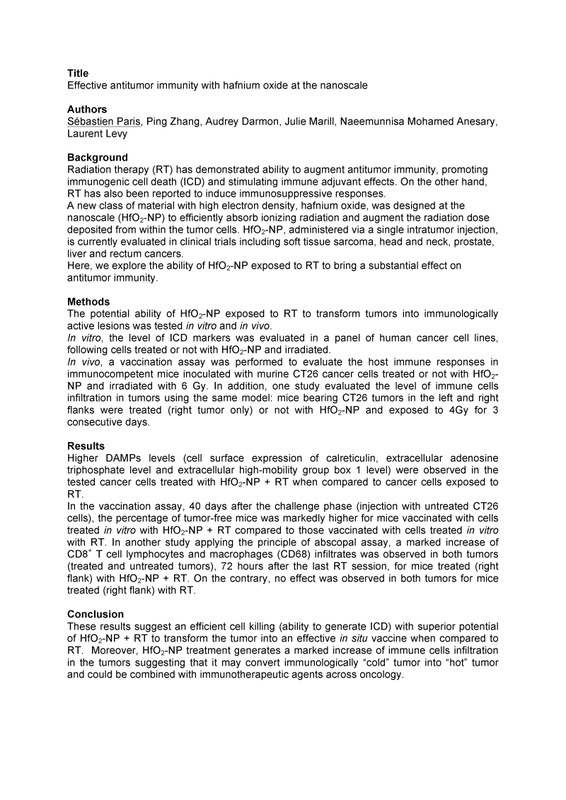 Conclusions: These results suggest an efficient cell killing (ability to generate ICD) with superior potential of HfO2-NP + RT to transform the tumor into an effective in situ vaccine when compared to RT. Moreover, HfO2-NP treatment generates a marked increase of immune cells infiltration in the tumors suggesting that it may convert immunologically “cold” tumor into “hot” tumor and could be combined with immunotherapeutic agents across oncology.